“Don’t go into the water today, it’ll be like wrestling eels”, warned my mother inlaw after inspecting the beach on her morning walk. High tide and rough seas had brought in huge quantities of seaweed which was still writhing in the surf. Heeding her advice, I grabbed my camera and sought watery inspiration elsewhere. 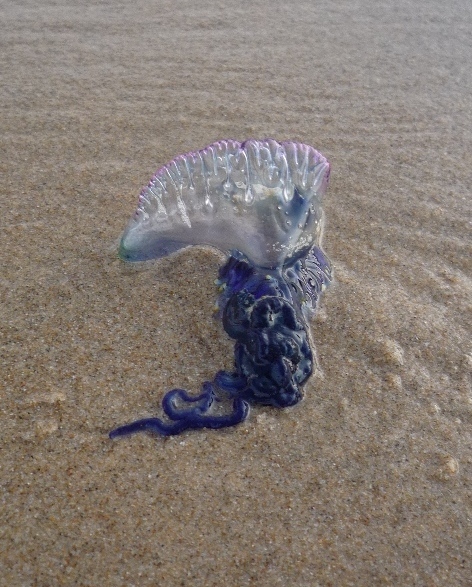 The stormy weather had also brought ashore a lot of Blue Bottles – another reason to avoid the waves today, as they pack a mighty sting! I snapped this beauty on the beach – it reminds me of a glass sculpture by Dale Chihuly. What do you think? This entry was posted in The Truth of Water and tagged art, biology, blue bottle, coast, Dale Chihuly, exhibition, gallery, sand, sea, seascape, stingers, storm, water, weather. Bookmark the permalink.